Five taste oothappam is easy to make if we have dosa batter ready, which is topped with 5 kinds of topping. Makes great dinner if we feel bore with same normal dosas. Topping No.5 - Pepper mushroom. Pepper mushroom : In a frying pan add finely chopped shallots saute then add finely chopped mushroom, fry until the mushroom oozes water and again becomes dry. Now add pepper and salt. Use as topping. 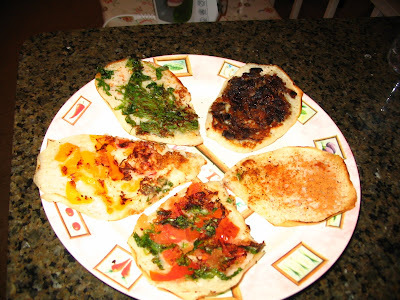 In hot griddle pour as small dosas and top with above toppings and turn carefully .Let them get crispy in the edges. Serve with chutney.